The term “Roulade” originated from the French word “rouler”, which means “to roll”. This means that any rolled dish can be called a roulade, including sushi. 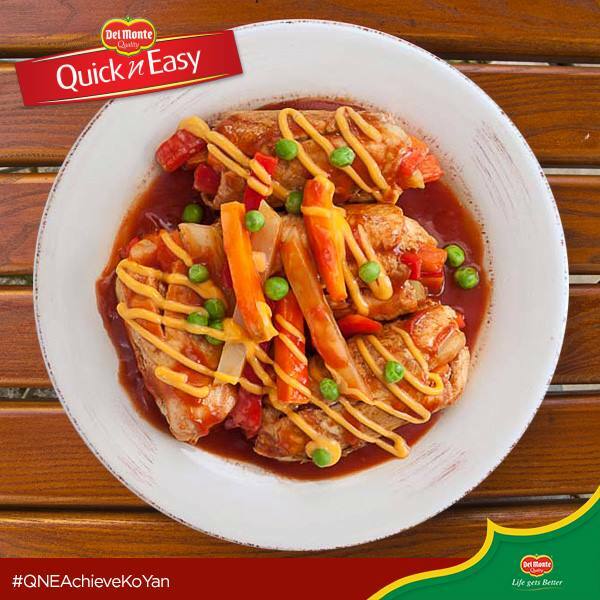 Cooking Chicken Caldereta Roulade like a pro is so quick and easy to achieve with Del Monte Quick n’ Easy Caldereta Sauce. 1. Season chicken fillet with ¼ tsp fine salt and ¼ tsp pepper. 2. Pound chicken pcs to flatten a bit. Mix 1 tbsp of Caldereta Mix and 1 tbsp Cheese Magic with chicken. 4. Heat butter with 1 tbsp oil. Brown chicken pcs on all sides. Pour remaining Caldereta sauce and water. Add excess vegetables. 5. Cover and simmer for 10 minutes. Add green peas. Allow to simmer. Drizzle with remaining cheese magic before serving.